Meals I Didn’t Make: S Does Dinner! S and I maintain a very fair relationship. We share our household duties, with the general principle that whoever likes a particular task more (or dislikes it less!) does it. He sweeps the stray hairs off the bathroom floor; I clean Moria-pee* from the carpet (shh, don’t tell my landlord!). When it comes to cooking, we try to take turns, but I often end up cooking more frequently for a few reasons – I enjoy it more, I’m more comfortable in the kitchen, and I’m usually better able to whip up a quick meal than S is (he’s fine following recipes but doesn’t quite yet have the kitchen confidence or experience that I have). However, dinnertime often devolves into the two of us standing in front of the fridge or the pantry, poking at things, shooting down each other’s ideas (or, um, that might just be me) and getting increasingly irritated as our stomachs start rumbling. It’s no good. So, last week, we finally implemented meal planning, something I’d wanted to do for a while. On Saturday or Sunday, we each choose two recipes to make for the week. We write down ingredients we need, do a grocery store run, and then take turns cooking throughout the week. We’re only on week two, but it’s already made a world of difference. Dinnertime is less stressful, and the meals we’ve cooked so far have been much better than the “Well, I guess we could do pasta and a cheezy sauce…” meals we might’ve resorted to in the past. In celebration of our newfound – and oh-so-simple – solution to the mealtime quandary, here are some shots of a couple delicious meals S has cooked up lately! 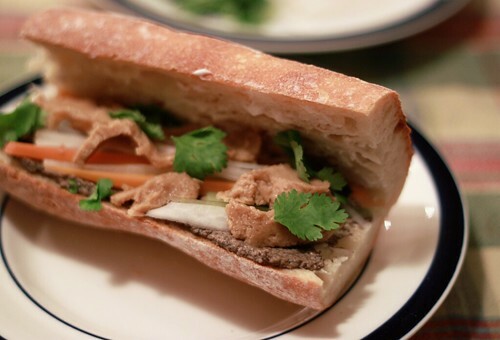 We had these delicious bánh mì sandwiches on Friday. S made some lightly pickled carrot strips, sliced up some daikon and cucumbers, and whipped up the Walnut-Mushroom Pâté from Veganomicon. We spread a bit of Vegenaise on a fresh baguette; added the pâté, veggies, and some seitan strips (err, chunks…); and topped it all with a sprinkling of cilantro. So yummy and fresh-tasting! 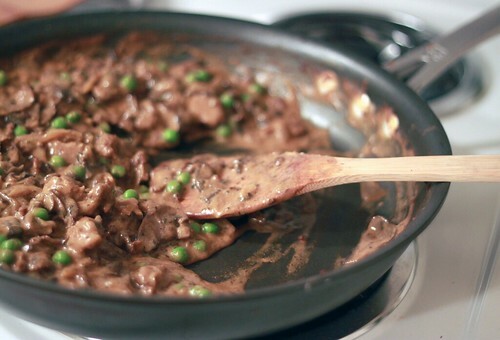 This pan is full of the Seitan-Portobello Stroganoff from Vegan with a Vengeance. Although I’ve made a whole lot of recipes from VwaV, this was a first for me! S did most of the work on this one, but I did some chopping sous-chef style to speed along the process. I also made a big batch of seitan ahead of time using the PPK recipe; I couldn’t bring myself to shell out nearly $10 for 3.5 cups of seitan when I could make it myself for a fraction of the cost! 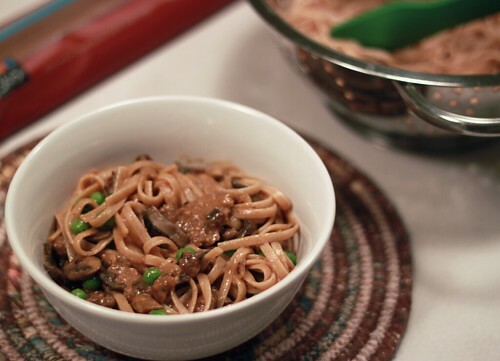 It worked perfectly in this recipe, and we served it up with whole-wheat linguine. This whole meal-planning thing? Yep, I’m a fan. It reduces stress and results in extra-delicious dinners. Everybody wins! * No joke – Moria peed on the carpet as I was drafting this post! I don’t know what gets into her, but every so often she goes through a period of floor-peeing. Then it stops. Daft doggy! Oh my goodness, those sandwiches look so delicious.